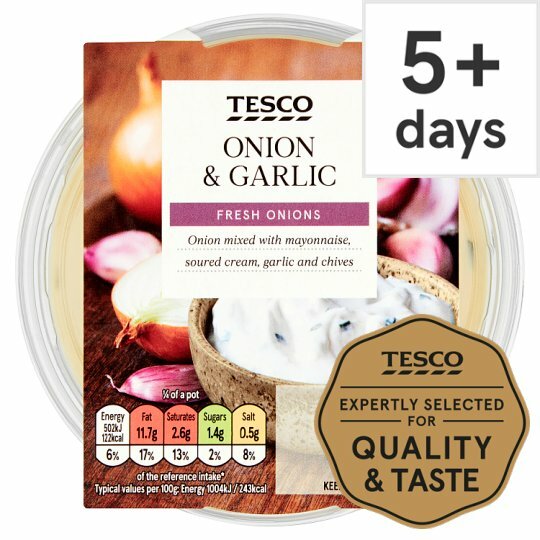 A mayonnaise and soured cream dip with onion and garlic. Mayonnaise, Soured Cream (Milk), Onion (10%), Rapeseed Oil, Garlic Purée (1%), Cornflour, Chive. Mayonnaise contains: Water, Rapeseed Oil, Pasteurised Egg, Cornflour, Spirit Vinegar, Salt, Sugar, Rice Starch, Citrus Fibre, Dried Egg White, Potato Fibre.